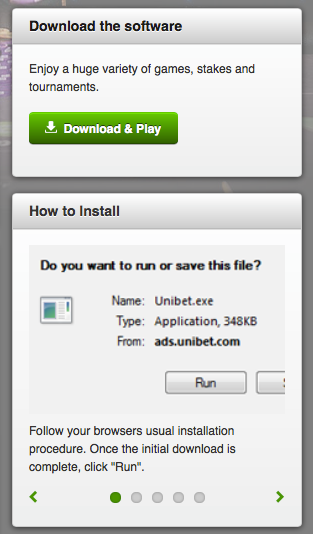 Unibet launching new poker software. Is it the right move? Unibet today announced that they will launch their own poker software and leave the Microgaming Poker Network. I understand that Unibet needs to do something since their poker has been declining for a year now, but do they have enough players to not be part of a network? I am not sure, but it will be really interesting to see. What I hope is that their future poker experience will be a lot better than it is today. One example of pretty bad user experience is when you access their poker page with a mac using Maverick then it seems like they don’t recognize me being on a mac. Instead I get the download & Play button (which only works for a PC) and I get installation instructions for the PC. This is really bad! Image 1. PC instructions when I access the poker page using my mac. It will be really interesting to see Unibet’s new poker software and I hope it will be a great improvement in user experience.